SF Mistressworks hopes you all had a merry celebration of your choice last weekend, and will have a happy New Year this coming weekend. Let’s hope 2017 doesn’t turn out to be as bad a year as 2016 is promising it will be. SF Mistressworks will continue to post a review a week of science fiction novels, collections or anthologies by women writers, published before 2001, for as long as we have reviews to publish. If you’d like to volunteer some reviews, email us at sfmistressworks(at)gmail(dot)com. SF Mistressworks wishes all its readers, contributors, and those whose books feature here a very Happy Holiday. Best wishes of the season. All things considered, 2014 was a good year for SF Mistressworks. Although we opened the year posting only one review a week, we moved to two per week at the beginning of March and kept it up until the end of the year. 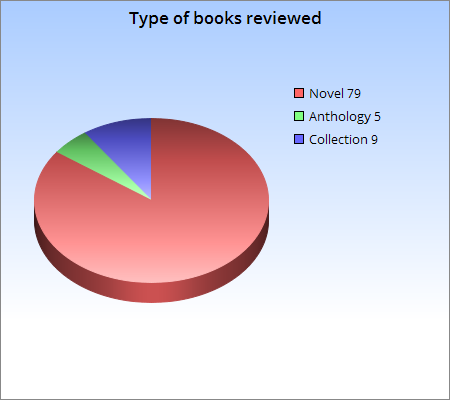 In total, we published 94 reviews of 85 books by 56 women sf authors. 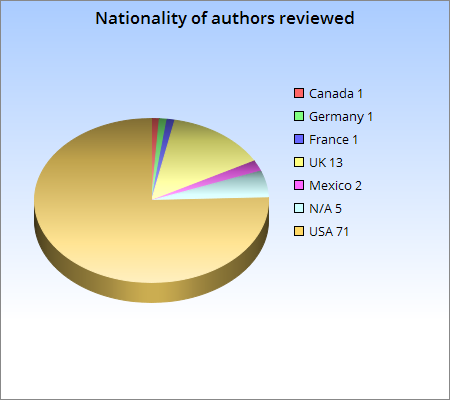 The reviews were provided by 20 contributors. The number one spot is a surprise – it’s not Le Guin’s best-known work, after all. I can’t think of any good reason why it might have proven so popular. The review of Star Rider, on the other hand, was linked to by io9 in a post on ‘Great Unsung Science Fiction Authors That Everybody Should Read’ back in March 2014. The Atwood and Carter are popular outside genre, so their presence is understandable – they may also be taught in schools. And The Female Man has, for some reason, been a much-talked about book in 2014, perhaps because of an ongoing re-evaluation of Russ’s place in the science fiction corpus. Le Guin, possibly the best-known female science fiction writer of all time, takes the first two spots. And the number one book is the most-reviewed book currently on SF Mistressworks, having been reviewed six times to date. PD James and Atwood are popular outside genre, and the McIntyre was one of the reviews chosen by Sci-Fi Romance Quarterly to re-publish in their magazine. See comments above re Le Guin. One of SF Mistressworks’ reviewers contributed a series of reviews of Bujold’s Vorkosigan books, hence her appearance at number two. It’s good to see Cherryh appearing, as she seemed to be one of those well-known authors who had slipped through the cracks. Wilhelm is a favourite of one of SF Mistressworks’ reviewers, and Randall is doing well considering her oeuvre comprises only half a dozen novels. Not much to say here – Le Guin and Bujold… While SF Mistressworks obviously attracts reviews of popular books, it has also posted reviews of far more obscure novels and authors. There’s a real sense of satisfaction to be had in discovering some long-forgotten masterpiece of science fiction, even if, sadly, a few of the more obscure books unearthed by SF Mistressworks reviewers – like Worlds for the Grabbing, Brenda Pearce; Second Body, Sue Payer; Countdown for Cindy, Eloise Engle – proved not very good. But there are certainly forgotten books which deserve to be much better-known, such as Busy About The Tree of Life by Pamela Zoline, or The Revolving Boy by Getrude Friedberg. What can we expect in the coming year? We’d like to maintain the two reviews per week schedule, which means we need more reviews. The guidelines are simple: science fiction, female author, published in or before 2001, review at least 500 words. Send reviews and offers to contribute to sfmistressworks (at) gmail (dot) com. We’ve no intention of giving up or closing down the site, although we may have to post less frequently if we don’t have enough reviews. There are certainly no shortage of books to write about. We’ve also been considering an infrequent short fiction feature, an in-depth review of an eligible piece of short fiction. One of those may or may not appear in 2015. In the past, we’ve posted the odd career retrospective, and we might try doing more of those – particularly for the lesser-known women sf authors. In 2014, SF Mistressworks partnered with Sci-Fi Romance Quarterly and Kwerey. We’re happy to do the same with any other relevant website – anything to spread the word. Just send an email to the address mentioned above. It only remains to wish every all the best in the coming year, and hope you’ve enjoyed and appreciated what SF Mistressworks has done in the past three years. A Happy Holiday to everyone from SF Mistressworks, and we hope you’re enjoying your day. In the two and a half years since SF Mistressworks began, it has posted reviews of 196 different books by 95 women science fiction writers, some of those books more than once. Thirty-six people contributed those reviews, most of which were reprints from other places – but some were original to SF Mistressworks. That’s an achievement to be proud of, I think. And we’ve no plans to stop. For a number of reasons, the schedule has unfortunately slipped on occasion. Toward the latter half of 2013, we had to go to a fortnightly schedule, but we’re back now to posting one review a week. Perhaps at some point we’ll be able to return to our earlier schedule of two reviews a week. In other words, more reviews of eligible books are always needed. That’s for science fiction books – novels, collections, anthologies, even standalone novellas – written by women and published before 2001. Reviews should be at least 500 words, and if not original to SF Mistressworks we’ll include a link to their first appearance. We’re toying with the idea of introducing an irregular series of reviews of short fiction during 2014. These won’t be scheduled, but posted as and when. The idea is to review – in 500 words or more – a single science fiction short story by a woman writer. Again, the story must have been published before 2001. Contributions are welcome.